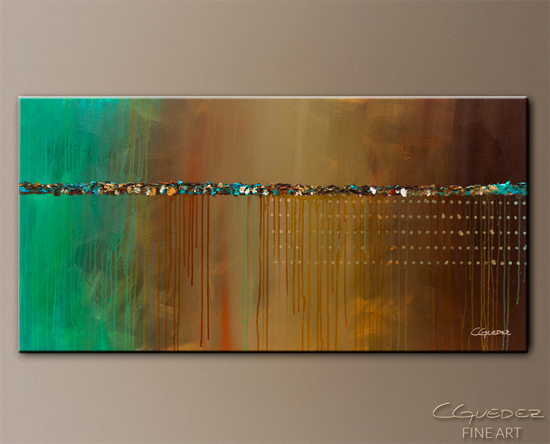 I create Original Abstract Art on gallery wrapped canvases. I focus on a Modern and Contemporary style. The edges of the canvases are pproximately 1 3/8" deep and they are painted, so no decorative frames are needed. I use a variety of techniques, oil and acrylic paints, pastels and other mediums to create plenty of texture and a 3D look. All Original Paintings for sale are 100% hand painted, and they are available for immediate shipping. All paintings, including oversized canvas paintings, are shipped within two to three business days after payment is cleared. Shipping and handling is FREE Worldwide. Make an Offer Now! On any original wall art for sale. After you submit your best offer, you'll get a response within 24 hours. Money Back Guarantee: Every purchase includes 100% money back guarantee or an exchange if you prefer. 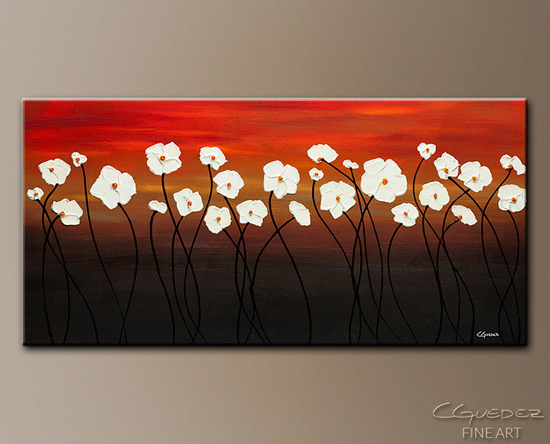 Flowers Art: Poppies, Daisies, Hibiscus, Sunflowers, bouquets, and more. Landscapes: Nature inspired paintings, trees, hummingbirds, butterflies, seascape, sunset, sunrise, fall/autumn. Abstract and Geometric Paintings: Represented by geometric figures and shapes. Music Art: Motivated by classic music, jazz and rock and roll themes, guitar, piano, violin, viola, cello, trombone, and other musical instruments. Symbols: Outlined symbols, signs, wine bottles and any other subject. Visions: Pure abstract, splashes, dripping art, any other crazy stuff. 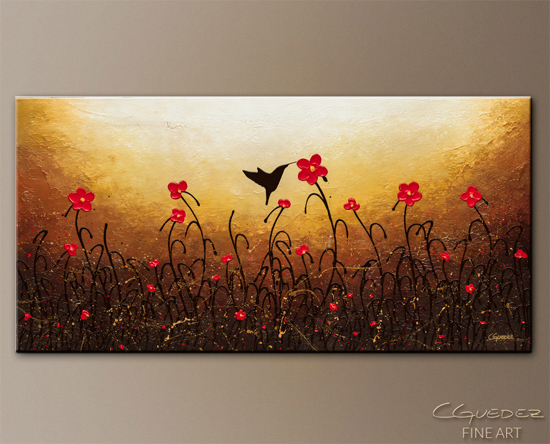 Most original paintings can be printed as Canvas Prints and Fine Art Photo Poster. Canvas Prints are the result of images printed on premium, acid free and heavy duty canvas. The high quality color reproduction results from a method for capturing the original painting with the leading technology for digital prints. These prints meet the most strict print permanence standards using archival inks and include a UV varnish to maintain their vivid colors and durability for many years. Fine Art Poster Prints are the result of images printed on an archival heavyweight high quality paper to enhance richness of colors and to provide an exceptional look. These giclee prints are the best alternatives at a fraction of the price of an original painting. They are desirable by collectors, fine art galleries, furniture stores, interior designers, among others; for their fidelity, quality and longevity. Each print is hand-signed by Carmen Guedez and accompanied with a Certificate of Authenticity. Abstract Paintings are not an exact representation of an object; they evoke a visual perspective of reality. With the coming of Abstraction (Wassily Kandinsky), artists started making big transformations to an unconventional art. Altering color and form, for example, they were able to either simplify or exaggerate the physical object, keeping a slight depiction of the original natural subject. In the 19th century, the Romanticism (William Blake, Theodore Gericault), and Impressionism (Claude Monet, Pierre Auguste Renoir) had enormous influence towards Abstract Art, achieving more form and structure as well as more expression and emotion into their paintings. Impressionist painters included noticeable brush strokes and vivid colors; and often depicted outdoor light changes (plein air) from time passages. Their approach that moved gradually to a dominant Abstract Art was to transform subjects from nature to a point where they no longer reflected a predictable reality. In other words, their paintings represented physical surroundings difficult to recognize. At the beginning of the 20th century, the Post-Impressionism (Paul Gaugin, Van Gogh, Cézanne), with similar characteristics of impressionism, but emphasizing geometric shapes, figures and simplified colors, led the way towards Cubism (George Braque, Pablo Picasso) and Fauvism (Henry Matisse). With these two major movements, the vision of art drastically changed to manipulate human emotion even more. The simplification of reality, where detail is eliminated leaving only some degree of recognizable form; the idea that color, line, and shape could be the subject of the painting; and the introduction of different textures and surfaces; developed a powerful non-representational, non-figurative or non-objective art. During this modernism transition and the great depression period, perhaps the most anarchistic art movements, Dada (Marcel Duchamp) and later, Surrealism (Salvador Dali, Joan Miro) revolutionized, expressing social injustice, anxiety, and a liberate imagination through their artwork. All these changes had a huge impact on Contemporary American Artists in the 1940s, during World War II. 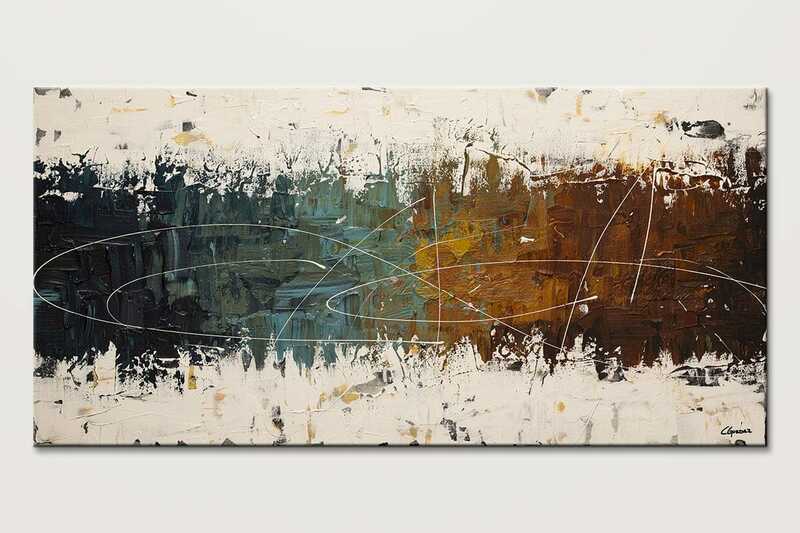 With a strong influence from famous European painters, and Germany in particular, a group of Abstract Expressionists living in New York City, focused more on impulsive intensity and self-expression. Emphasizing performance art in a spontaneous way, artists showed deep feelings and uncovered impetuous emotions in their paintings. This avant-garde art movement is also best known as “Action Painting” or “The New York School” (Jackson Pollock, Willem de Kooning). In pursuing this direction of Modern Art, the “Color Field Painting” (Clyfford Still, Mark Rothko) was originated in the context of diversity. These painters were moving away from a gestural style and action to the fundamental idea that color became the subject itself. Modern styles like Pop Art (Andy Warhol), and Minimalism (Frank Stella) emerged mixing past styles. Pop Art brought realities of everyday life to the mass through media, advertising, movies, comic books, newspapers, television, and music. It was mainly a British and American movement, and artists used mechanical reproduction techniques of printmaking. Minimalism was essentially characterized by basic geometric forms and elements of Design and Architecture. The subject was reduced to its minimal component to achieve simplicity, revealing the abstract quality of space and conveying a simply attitudes toward life. Art has always been in the mind of a creative person. Abstract Art and Abstraction involve and explore basic human emotions. And, therefore, Abstract Paintings manipulate people’s feelings, creating emotions that they otherwise would have never imagined. This explains why Abstract Art is my Passion. It opens my mind to something unimaginable. It brings thoughts, experiences and feelings you can only find in something you truly love.